Javi: I remember last year watching director Clay Liford's EARTHLING and thinking that this was a great story but with a flawed and confusing execution, but I wanted to follow the director. His ideas were interesting and made you think in the way that a science fiction movie should. So this year, when was I scheduled to see his latest movie, WUSS, I was hoping to see what else he could do. What we got is an attempt that seems to fall a bit flat. The highlight of this movie for me are the actors, between Nathan Rubin and Alicia Anthony, I think we have a very formidable pair of leads. Rubin as the titular wuss, Mitch Parker, delivered a sense of frustration and anger towards his tormentors and for his own weakness that was down right powerful. With Anthony, you have a girl who plays a character beyond her years rather convincingly with acting with her eyes and her expressions more than with actions. My big problem with the movie is that I never quite feel like I'm watching the same movie throughout the running time. There's a certain point where the tone shifts abruptly, and I never quite recovered from it. It seems the movie can't decide between being a comedy or drama, or a romantic comedy, and so I just felt constantly frustrated trying to figure out the movie. By the time the ending rolls around, I realized how very little I cared about the characters and what they went through. 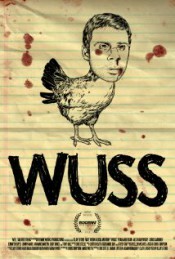 Jonesy: WUSS follows a substitute teacher who lands a long-term sub job at his old high school in Garland, Texas, and we follow him as he tries to connects with the kids, figure out his life, and find romance. I've been a substitute before, and it's not a fun job. To be successful, you have to go in with confidence, or the kids will walk all over you. Our hero, Mitch Parker (Rubin), lacks any sort of self-confidence, so you can guess what happens. His one solace is his best student, Maddie (played by Alicia Anthony), who feels sorry for him and befriends him. Now, director Clay Liford attempts to show us almost a redemption story with Mitch. Mitch has never really been cool; he still lives at home with his mom and perpetually PMSing sister, has regular D&D sessions with his high school friends who also never left, and isn't finding success with anything he does. He's pitiful to watch. However, instead of Liford's script being a character study, he waters it down with weird plot point after plot point that ends up more unfocused and tonally inconsistent than bringing any real truth to Mitch. I realize WUSS wasn't trying to be DANGEROUS MINDS (Mitch actually flat out says this in the movie to his friends), but I'm still not sure what the movie was trying to say. There seemed to be some commentary about the public school system, but the idea was never really explored. Also, there are many different types of relationships: student and teacher, mom and son, friends, sister and sister. Some could have taken a very interesting and deep look at what's important and appropriate, but again, all of these just touched the surface without any real pay off. In the end, it felt that Liford's WUSS was a great attempt at storytelling, but it just fell short. The acting by the two main characters made the movie watchable; however, the story was too unfocused to make an impact.